With hindsight, late September 2010 was the first time I had what I felt was an episode of atrial fibrillation. When I returned home after exercise, my heart was going crazy. I canceled a movie date with my husband because I was feeling so badly. I thought I might be having a heart attack. You’re probably wondering why I didn’t do anything—like run to the emergency room. 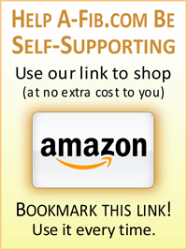 I had recently been to so many doctors as a result of a late and difficult menopause (I was a 63 year old at the time) that I did not even trust my own symptoms. And the amount of time I was spending involved with the medical system exhausted and depressed me. I explained away the 3-4 hour heart episode to myself because I had previously been diagnosed with a minor leaky mitral valve. I thought the leaky mitral valve was probably getting worse. Late November 2010 after a minor hamstring injury, I went to a walk-in clinic because my husband and I were planning to leave the country January 1st for 9 months. And also I wanted a referral to a physical therapist. The nurse noticed my irregular heartbeat and sent me to get a heart monitor. I had had heart monitors before, and the arrhythmias I had had were not of any concern then. Although I anticipated the same result, I had begun to notice around this time I was winded when walking the one flight up in our house. This was a change since I exercise regularly. The results were not as I had anticipated. My heart was stopping for up to 4 seconds at a time (at 7 seconds a person will pass out). All of my life I had had a very slow pulse (under 50), and I had noticed recently that my pulse seemed even slower than that. I was diagnosed with absolute bradycardia and sick sinus syndrome and was at risk for heart failure. The cardiologist said I needed a pacemaker immediately. I hesitated for a little (a few hours) thinking I would get a second opinion. But as he stressed that I could not drive, I realized I needed to go ahead. Four days later I got a pacemaker. The actual surgery for putting in a pacemaker was not a very big deal. Laying still on the plastic-sheeted bed in the hospital for 24 hours post-surgery was the most difficult part. I did have an vaso-vagal episode with my blood pressure dropping precipitously the day after surgery. The cardiologist rushed to the hospital. But by the time he arrived, I had normalized. He said it could have been a post-surgical reaction or a reaction to the Lopressor he had started giving me for the A-Fib. I did not know I had been started on this drug in the hospital, but had warned him previously that I had a lot of problems with medications. I was very afraid that I would not be able to tolerate any of the meds for A-Fib. I went to the pacemaker clinic one week post-surgery and got a number of adjustments; i.e. they turned something down so I wouldn’t feel the pacemaker begin pacing. Later they adjusted it so that when I was exercising, I wouldn’t feel like I was getting “stuck in first gear”. My point is to encourage people to report whatever issues they have with their pacemaker—there may be a quick fix. Also, there is a useful site online called the Pacemaker Club – a forum for those with pacemakers — that answered many questions for me. Another issue post-surgery that I had was being afraid of moving my body. My cardiologists noted this insecurity and told me to relax, that the only things I couldn’t do were lift heavy weights and lift my left arm for a while. But otherwise I should act normally. The other problem my heart monitors uncovered was atrial fibrillation (I had two monitors for 48 hours each in early December 2010). As I said, I was beginning to notice it more and was actually in A-Fib up to 40% of the time. 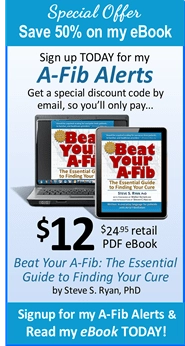 Receiving the news regarding A-Fib was quite disconcerting. My cardiologist gave me some literature from the drug companies that made me think my old life was over, etc. I was freaked out over what this would mean for the long term and for the short term as well with our planned journey abroad. At the time of my diagnoses, I was only given a blood thinner, Pradaxa, which I had no problems tolerating. I am guessing that because of the impending pacemaker surgery, the cardiologist did not immediately treat the A-Fib. One of the reasons I was so bummed about the A-Fib diagnosis was I thought I would have to be on these heavy duty blood thinners. They made me nervous. I had lived an active lifestyle and, for instance, during 2010 several things had happened that, had I been on Pradaxa, could have been quite serious (exercise injuries, breaking finger). So I was very happy to learn that because my CHAD score was 0, I could take baby aspirin instead (although Steve Ryan is not excited about this option—I won’t detail this debate here). My research on the web during this early period fortunately led me to Steve Ryan’s site right away. I admit I was skeptical at first about his use of the word “cure” for ablation; but after reading the site carefully, it was obvious he was very thorough and all-sided in his treatment of the subject. To put in an unsolicited pitch here, I immediately sent him a donation as his site had given me much peace of mind, and he was also so helpful and responsive to every little query I have had. So send in those donations—he deserves it! He has served as my trusted second or third opinion over and over again, and the site is a gold-mine (including the summaries from the annual meetings). I was torn about getting an ablation immediately and still being able to leave the country on our trip in January. I went to a world-famous cardiologist in a larger city nearby to discuss an ablation, and it was a very unpleasant experience. (He was in a big hurry, being so important and all. And when I tried to explain my story, he interrupted me and said “stick to the point” and sent me for a money-making exam I had just had in the last month that my insurance wouldn’t even cover. This fancy office seemed to routinely send everyone regardless if they needed it or not.) He, along with two other cardiologists I saw, recommended the same thing: start taking Multaq, go on your trip, and have your ablation when you return in fall 2011. I decided to have a local EP do the ablation rather than travel to other places, because his success statistics were as good as any nationally, and he was so highly recommended by my other doctors. He does ablations all the time and has done them for some time. Also, I liked his protocol for using conscious sedation and follow-up care. While he said I could travel post-ablation, he wanted me to be able to check in with him after a month and again after several months, which I thought was more thorough than some of the national ablation centers that let you go on your way after a couple of days. I had to stop the Multaq five days before the ablation to put me back into A-Fib pre-procedure. The actual procedure for me was shorter than usual, 4 hours, since he said only one vein was where all the misfirings were coming from. Since you are out of it the whole time, there is nothing really to be concerned with. I had correctly anticipated the problem would be lying in the bed post-ablation, and I recommend asking your doctor for an order in advance for some strong painkiller (like morphine or dilaudid) if you have a problem. I suffered for about an hour when they tried to get that painkiller order from the doctor. (I don’t have the strongest lower back in the world.) I also asked the staff before the ablation to put cotton bedding between me and the plastic bed cover, and this helped with my hot flashes. Editor’s comment: The Operating Room report indicated that the pacemaker leads did interfere with the proposed ablation of the Superior Vena Cava (SVC) in the right atrium. An ablation line is often made in in the right atrium SVC as a precaution to prevent Atrial Flutter from developing. But this SVC ablation wasn’t able to be done. 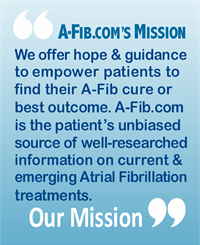 However, it’s encouraging for A-Fib patients with pacemakers that a normal left atrium ablation can be performed, that in this case pacemaker leads did not interfere with a standard Pulmonary Vein Ablation (Isolation) procedure. Would it have been better to perform a right atrium Flutter ablation as well as an A-Fib ablation? Yes. 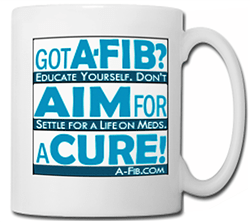 But the main objective was achieved—freedom from A-Fib. A patient may never develop A-Flutter even without a SVC ablation. They did give me a Foley catheter which was really great in avoiding bedpans, but I got a urinary tract infection. So drink lots of water (not sugary juices) to help avoid a UTI if you have a catheter. If you have the choice, request one. My EP said he had not been able to induce A-Fib despite high doses of epinephrine and getting my heart rate up to 140 during the procedure. So he was hopeful, but we wouldn’t know anything for a couple of months. Back to Pradaxa and Multaq for at least a month. He also predicted post-surgery A-Fib, which I think I had the first night. The good news: resetting the pacemaker solved all those problems in 2 seconds. And I am having zero A-Fib after 3 months, and feel stronger and healthier than I have in a long time. I have Anthem insurance. They disputed the $88,000+ bill/procedure twice. While I was not bothered because I had anticipated a debate and have been through “insurance battles” before, I was surprised that at three months it seems resolved. My bill amounted to under $400 for doctor’s fees and everything else. 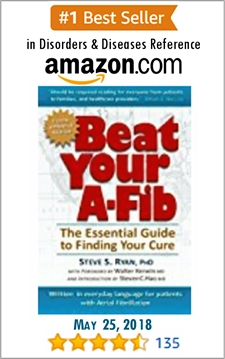 Living with atrial fibrillation and taking the drugs to control it (with their risks and side effects for the rest of my life) and the increased risk of stroke and heart attack versus the good possibility of a cure after a ablation procedure with relatively low risks seemed like an easy choice to me. I admit I have had several serious surgeries in my life and been fortunate to have had good surgeons and good results, and I also have decent medical insurance. With menopause my health has declined, and I was very upset about the prospect of living with A-Fib, blood thinners, and the limitations—particularly the fear—this would be on my activities. 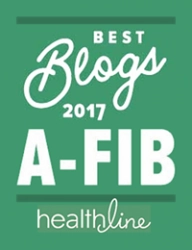 One important thing that made this a no-brainer for me was my A-Fib would eventually go from part-time to full-time over a period of years. I felt I had no choice really as that was not a future I wanted to negotiate, if I had a good chance of avoiding it. My strongest advice is to find an EP with lots of experience and good statistics on results, and especially someone whom you feel you can trust.